Casa Villa Vueltabajo is located in neighborhood of Pinar del Rio „La Tirita”. The casa rent two comfortable air-conditioned bedrooms with private bathroom, two terraces overlooking the surroundings and parking. The owners offer breakfast and dinner plus guide service and transportation. 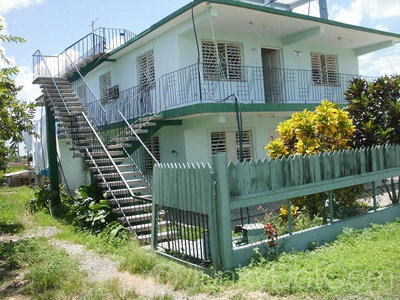 2 rooms (3 persons each) with private bathroom, airconditioning, parking. There is a separate dining room + living room with TV. My review about the casa: It is in a quiet middle class neighborhood not far from the main part of town. The entire house was spotlessly clean in every room. Very comfortable home like feel. Sitting on the Veranda as the day unfolded and the sounds of the town waking up just added to the entire experience. I would definitely go back here again. How was your room? : Spotless, Clean. Very roomy, Private Bath with Shower and All the necessities, Towels, wash cloth bath Mat, Toilet Paper, Soap, hair dryer, clothes drying rack. How was the food they offer? : Absolutely wonderful. Maria prepared food as you would see it in a fine restaurant and it tasted twice as good. Fresh Juices, Sliced Fruits, Soup, Salad, Ripe Plantains, Lobster, Chicken, Beef, Yellow Rice, Breakfast Eggs any way you wanted them and cooked perfectly, bacon, more fruit, Juice, Bread, Toast, Espresso, Cafe con Leche and it goes on! I had special eating needs for health reasons and they were accommodated without a second thought. Other services they offer: Taxi to and from Marina Hemingway. Other comments: Just a wonderful couple in a nice home providing you with a taste of Cube very graciously while making you feel very welcome in their home.